With the global population on track to hit nine billion by 2050 — up from 7.2 billion today — food security is becoming a major international concern. Yet that 25% rise in the world’s population in the coming 30 years could see food demand skyrocket by as much as 60%. Demand for food is expected to grow faster than the population as developing countries modernise and adopt western-style diets, consuming more processed foods and meats that will require an exponential increase in grain production. Add to that the challenges of rising energy prices, and things like groundwater depletion, the loss of farmland to urbanisation, as well as adverse weather events caused by climate change. Without drastic changes to the way we farm and produce food, a serious supply crunch could be on the way. This trend has leading international bodies concerned. Achieving food security, or “Zero Hunger”, is number two on the United Nations list of Sustainable Development Goals (SDGs) targeted for 2030, right behind eradicating poverty. Ultimately, the solution will lie in increasing farm yields and agricultural production and delivery efficiencies. It is an award-winning New Zealand agricultural technology company that offers growers of irrigated crops with digital agricultural technology expertise that’s based upon scientific research and delivered with cutting edge technology. It combines science, agronomy and technology, all interwoven into an expert system for decision support. The technology delivers a real-time industry leading soil monitoring solution that combines cutting edge software with robust sensory probes to optimise crop yield and results. After launching its flagship product into Washington State, USA in 2017, the company is servicing a significant portion of the horticultural growers in that state — with a market share for some crops as high as 30%. The company is strategically targeting crops with high performance, growth trajectory and market share potential. This largely depends on each region’s potential, from citrus in Sunraysia in Australia, to hops and apples in Washington State, potatoes in Idaho, or even hemp in Oregon. The company is heavily focused on the Pacific Northwest region of the US, which comprising Oregon, Washington State, Idaho, Montana and Wyoming, and is one of the country’s richest ecological areas. The region boasts some 570,000 acres of farmland (30% of the region’s total land area), and houses 300+ types of crops including wheat, hops, pears, potatoes and hemp. Its proximity to key Asian markets and natural deep water ports in Seattle and Portland make the Pacific Northwest a key agricultural region for agtechs to target. This was demonstrated in the strong progress made in Washington, where the company recorded a fivefold increase in the adoption of its flagship agtech solution in just 12 months. This offering was developed by leading agronomists with over 30 years of research, providing users with concise actionable data at the click of the button on their smartphone. Due to this exceptional result, the company has now turned its attention to capitalising on emerging agricultural and irrigation trends in neighbouring states. In October, it expanded its operations across the border into Idaho and has since set its sights on Oregon. Idaho is the largest producer of potatoes in the US, while Oregon is offers significant opportunity in the industrial hemp market — one of the fastest growing agricultural spaces in the US, with estimates that it could be worth US$20 billion-plus within five years. Demand for hemp is driven by an increasing consumer desire for high-quality cosmetics, personal care products, protein supplements, and other health food products that include hemp extracts such as CBD. 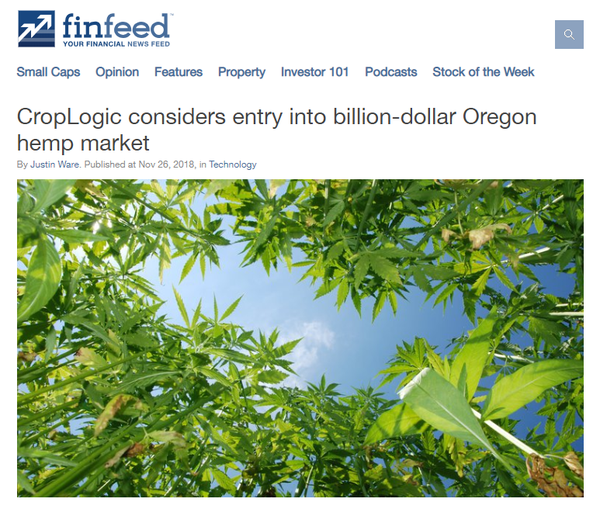 The company has appointed two consultants, a corporate advisor and lawyer to advise it on the current state of, and opportunities within, the industrial hemp market in Oregon specifically. Expanding beyond the US Pacific Northwest, in August the company completed the setup of its Australian HQ in Mildura, the unofficial capital of the world renowned Sunraysia horticultural region. 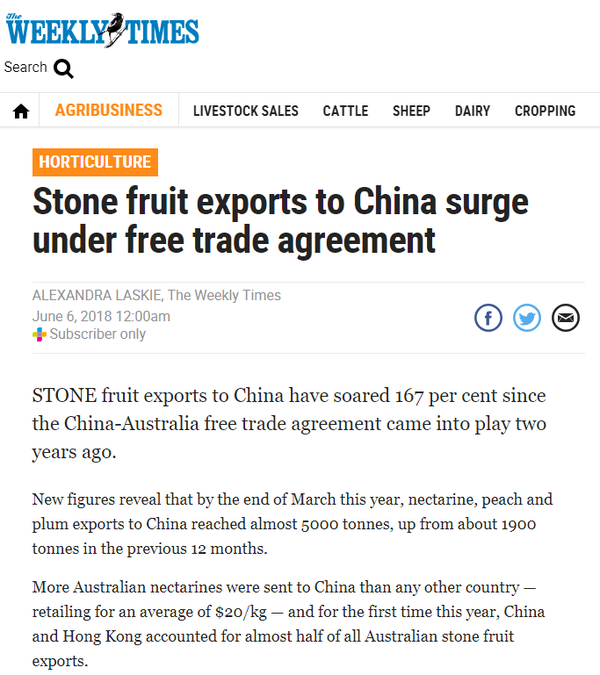 This news could not have come at a better time, with many of the company’s target crops in Australia experiencing booming Asian demand. CropLogic (ASX:CLI) is an award-winning, global ag-tech player. Founded in 2010, the company was born out of intellectual property from the New Zealand Institute for Plant and Food Research Limited. It offers irrigated crop farmers and digital agricultural technology expertise, weaving together science, agronomy and technology into an expert system to support decision making. In combining its intuitive patented technology with crop science, the company is well on its way to emerge as a leading provider of end-to-end agronomy services for larger scale crop growers. CLI continues to expand its partnership network. The company boasts two core technologies: CropLogic realTime (realTime GrowerView - remote sensory technology) and CropLogic Aerial Imaging. realTime GrowerView solution is CLI’s flagship product. It was developed by leading agronomists, and is the result of over three decades of research it assists producers in making performance-enhancing irrigation and agronomic decisions. 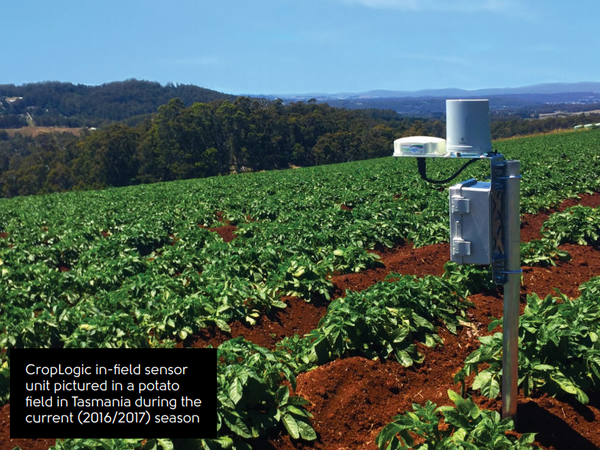 Built on the IP the company sourced from the New Zealand Institute for Plant and Food Research Limited, realTime is a durable soil moisture monitoring solution that allows growers to optimise crop yield and performance. realTime GrowerView predicts the behaviour of crops’ soil moisture levels and provides accurate and concise insights presented in a digestible format. The actionable information helps coordinate farm activities including monitoring, tracking and accessing soil moisture data with the simple-to-use app and dashboard. The easy-to-install sensors are reliable and robust, making them suitable across all soil and crop types. The company has made major inroads in the US state of Washington with this product, where it services the world renowned Columbia, Yakima and Snake River basins. Only a year ago, in 2017 there were 87 reported CropLogic realTime sights in the state — there are now 522. That’s a more than 500% increase in adoption over a single year. The following video explains how realTime GrowVview works. Easy to install sensor probes are deployed on site, providing live feedback to the realTime GrowerView app/desktop dashboard. CLI's in-field sensor tech at work. The realTime GrowerView app is compatible with Android and iOS devices and provides accurate insights at the click of a button 24/7, allowing farmers to cut overheads and manage their crops around the clock. Data is also accessible via the platform’s desktop dashboard. With the heavy development phase of realTime GrowerView complete, the company is adopting a new subscription model for the service. It provids the option to buy the hardware outright or take on a three year lease. 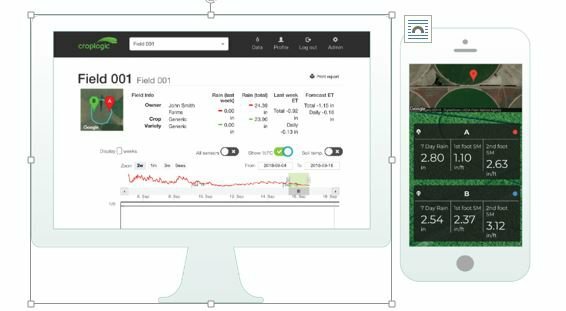 The three year subscription is available for the subscription bundle, including the realTime GrowerView desktop portal and realTime GrowerView mobile app. Market testing to date has involved large producers, farm managers, distributors and direct growers, with initial results suggesting a clear preference to buy the hardware outright with CLI’s pricing model generally well received as there’s dissatisfaction with similar systems on the market. 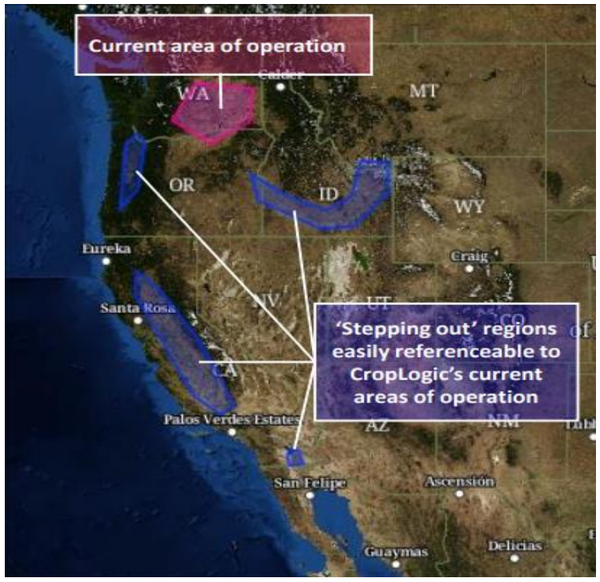 CropLogic’s second offering is its Aerial Imagery service (available in the USA), a powerful solution to aid in early detection and intervention of problem areas on the farm. It provides a bird’s-eye view of crops health with high-resolution digital infrared, vegetative index and normal color imagery. The highly actionable imagery is a 24-hour turnaround service, which notifies clients via text when their images are ready to view. This offering is a potentially game changing first line of defence against pest or weed infestation and nitrogen deficiency, with current conventional crop assessment methods taking up to weeks to be finalised and returned. High-resolution digital infrared, vegetative index and normal colour imagery are the three services offered under the Aerial Imagery solution. 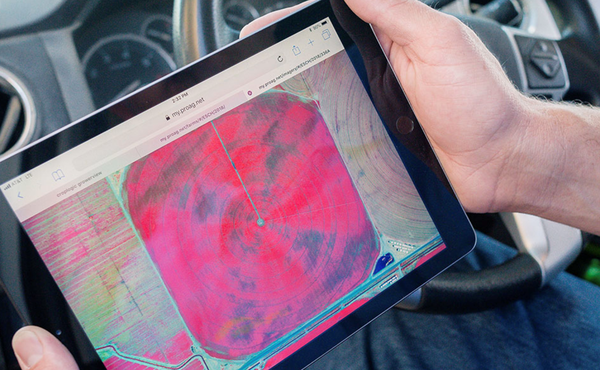 This allows users to gain insights into their crops’ health; predict crop behavioural trends with chronological image display dashboard; effectively coordinate your farm activities with 24 hour imagery turnaround; perform reliable and periodic image capture scheduling; and utilise after-sale hands-on services provided by local and experienced agronomists. CropLogic has successfully pivoted from an acquisition focused strategy to one dominated by a direct and partnership sales model. Adding to this success, and further to the regional offices being established, CLI has recruited capable agricultural and agronomy sales staff. It is now focussed on commercialising its technologies, having adopted a business-to-business subscription model, offering end users greater flexibility. The increased flexibility for customers is reflected in CLI’s back pocket, as demonstrated in the six months to September 30, when the company received A$1.5m in revenue, putting it on track for revenues of A$2.2 million for the year. This result came after CLI hit a number of milestones and growth markets in Southern Australia and the Pacific North West researched and regional offices established. These developments, in collaboration with local government agencies, research institutes and development corporations, have certainly handed CLI a boost in these regions. The change in group strategy away from an acquisition strategy and towards a commercialisation strategy via direct sales and partnerships is beginning to pay off with CLI poised for growth in the current quarter and into 2019. Coinciding with this pricing model change are its redefined goals for the next six months. It’s targeting its first sales out of Mildura, Twin Falls (Idaho), and soon to be set up Oregon regional offices. Given its strong results in Washington, it comes as no surprise that CLI has set its sights on neighbouring Idaho and Oregon. In October 2018, the company opened its new regional sales office in Idaho, which promises to be a key strategic move. Idaho is the USA’s largest producer of potatoes, second largest state for water withdrawals/milk production and ranks third by dairy head. As a result, the company will target row crops (primarily potatoes) and forage/hay opportunities in the state. While CLI technically has a presence in Oregon (northern Oregon is currently serviced by the company’s South Western Washington Office), it has made no secret of its ambitions to setup shop in the state. This expansion could be highly lucrative for CLI, considering Oregon is the USA’s largest producer of many berries (including blackberries and boysenberries), the largest producer of hazelnuts, the second largest producer of hops and pears, and the third largest producer of industrial hemp. In a highly encouraging sign that the company is following through with its stated strategy of targeting crops with high performance, growth trajectory and market share potential, on November 25, management disclosed that it is investigating opportunities in the hemp market. This strategic decision position the company in what the Brightfield Group estimate could be a US$22 billion market by 2022 in the US alone. While hemp is used to produce more than 25,000 products, it’s seeing significant demand as an ingredient in high-end cosmetics and protein supplements, as well as other health food and personal care products, driven largely by consumers’ heightened environmental awareness. Increasing R&D activities to develop agronomy practices around hemp production is positively impacting hemp yields and product quality. Also working to CLI’s favour is that Oregon, where the company has existing operations, is the third largest State in the US for industrial hemp production. The company has been servicing Oregon with its agronomy expertise for some time and views it as a key state for future growth. This location, combined with CLI’s agronomy and digital agricultural technologies, position the company to capitalise on these global trends in hemp and CBD production. The company is wasting little time in verifying this opportunity, appointing Green Rush Advisory Group and Green Light Law Group to evaluate further market entry opportunities in Oregon. The pair will produce a comprehensive report on the industrial hemp market in Oregon to assist CLI in deciding whether to proceed. Assuming the findings are positive, CLI is targeting entry into this market during the 2019 Oregon growing season. In July, CLI secured office space in the large regional town of Mildura, Victoria. This development was achieved in collaboration with the Victorian Government and SproutX as part of the Smart Farms Program. region moving forward, which has been identified as a key region for realTime GrowView adoption. CLI's target geograph the 'Southern Regions' showing the location of Mildura, Victoria. Sunraysia is an important economic region that is renowned for its exceptional horticulture including citrus and stone fruits, row crops and grain farms. 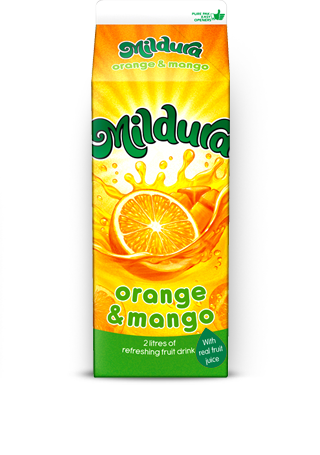 It is home to several prominent produce companies such as the Mildura fruit company, Sunraysia Produce, The Daily Drinks Co (producer of the iconic Mildura juice range). Mildura is home to several prominent produce companies. CLI’s Mildura office has been up and running since August, headed by Cedric Geffen, who brings over 30 years of experience in agri-sales as Regional Sales Manager. CLI will hook into current regional crop trends in the region with a focus on avocadoes, row crops (potatoes), apples, and stone fruits. Export trends have been widely covered in the media. These export trends, in combination with ongoing tensions around Murray-Darling Basin water management, have created a region ripe for disruption. With its Mildura sales team now locked in, CLI anticipates swift adoption of realTime GrowerView, which could slash users’ water consumption in the region and drive wider spread adoption throughout Australia. Historically, CLI has operated under a roll-up or acquisition business model. This initial model did have its benefits, as CLI now holds 30% ownership of the potato production client base in Washington State. The company has recently adopted a more direct business-to-business strategy (as mentioned previously), with acquisitions taking a back seat to day to day operations. In a November 9 research report from Reach Markets, the group determined that CLI’s shift to its new commercial-led model was a positive move. It concluded that, “The shift away from acquisitive strategy is the right one, as roll-up strategies seldom work, in our view. [...] whilst the temptation is there for management to acquire company after company to quickly grow its presence and footprint, our experience in covering companies deploying roll-up strategy is one that it has more often ended in shareholder destruction over the long-term (sometimes spectacularly – e.g. ABC Learning)”. It also lauded the expansion into Australia, which “presents a significant near-term opportunity and share price catalyst”. Does CLI offer a near term opportunity? 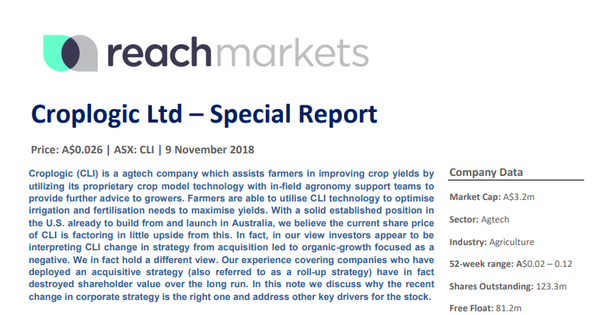 The report found that CLI’s fresh commercialisation strategy holds upside that is not being reflected in the company’s current share price of just over 2.0 cents. Of course this is just broker speculation and interested parties should seek professional financial advice for further information. CLI has developed a flagship product that has performed strongly in a high demand sector, and is one of the few agtech companies that holds a globally patented offering that has runs on the board. Swift product adoption in Washington, paired with the positive reaction to its commercial-led approach, means CLI is well placed to embark on its commercialisation-led strategy. These factors paired with its ability to tap into emerging agricultural trends is a promising sign for CLI shareholders, especially when taking into account the surging industrial hemp market and Australian expansion potential.